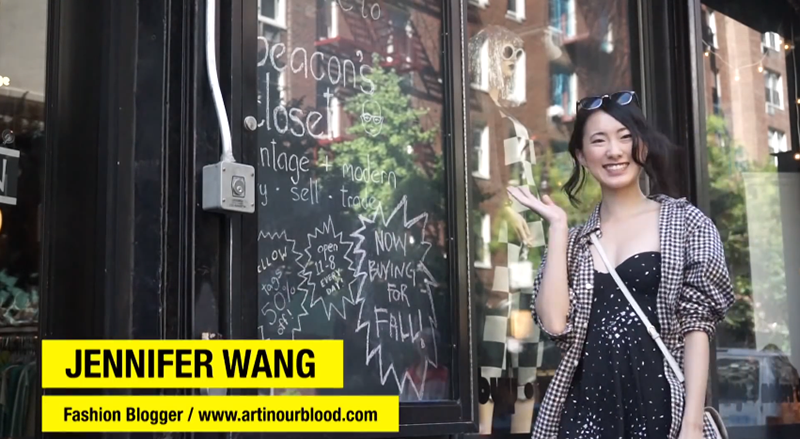 Today I want to share with guys a video I did with Chictopia and fellow fashion blogger, Barbro Andersen for the Chictopia Youtube channel on the "Best Thrift and Vintage Stores in New York!" (So yes, you will hear my voice in this!) It is always weird for me hearing my voice in any type of recording but I actually feel like my voice didn't sound so strange to me in a video for once haha :) For this video, I took Chictopia to my favorite thrift store in New York, Beacon's Closet, which is right next to Parsons. I've found a lot of interesting vintage and designer pieces there, and have also sold many of my clothes there. Chictopia also went to another one of my favorites, No Relation Vintage, which is full of vintage pieces (in comparison to Beacon's, which has a lot of more recent designer pieces) and notably has a huge selection of high waisted denim shorts for like $5-10 each! Anyways, I hope you guys will enjoy the video and will stop by these stores if you get a chance in the future :) If you like this video, be sure to browse some of the other fun videos Chictopia does for their channel too! Have a great weekend everyone! ohhhhh! Thrifting in nyc looks so fun! That's some nice price ranges! Loved hearing your voice! Inspiring video. Wish I lived in New York!